South Korean brokerage house Samsung Securities is stepping up its support of foreign investors seeking investment opportunities in North Korea. The efforts are being spearheaded by the securities firm’s in-house North Korea Investment Strategy Research Team, established on June 8 as a first in the securities industry here. 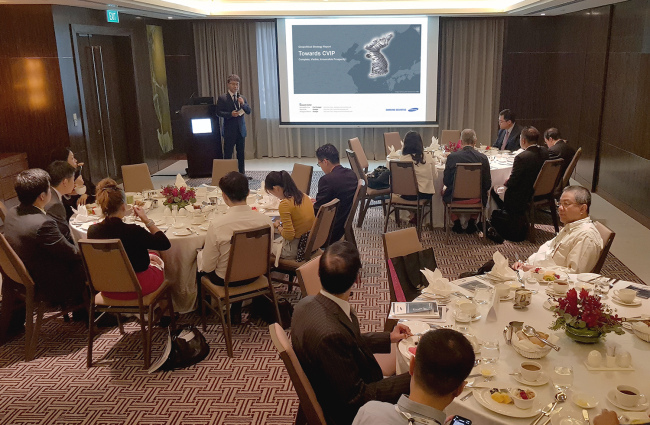 A recent example is a session on July 19 targeting officials of private equity funds or asset management firms, during the two-day AVCJ Private Equity & Venture Forum held in Singapore. The session was presented by head of the team Yoo Seung-min. This came amid a lack of channels for investor information related to North Korea infrastructure development and economic cooperation between the two Koreas, according to the company. Yoo has authored geopolitical strategy reports, including “Towards CVIP” and “They all have dreams: Changing circumstances on the Korean Peninsula,” as well as a report in the Korean language centering on tentative plans and prospects for a new development bank in Wonsan, Kangwon Province, North Korea. Yoo added there are hurdles for North Korea investments, including sanctions on the country and a void of policy framework for investment. The team’s strategic partners, including China’s Citic Securities and Vietnam’s Ho Chi Minh City Securities, have allowed the team to be offered resources on North Korea economy, according to Samsung Securities.